Jeffrey Hess, BALL Watch USA CEO and author of ‘Rolex. The Best of Time: Rolex Wristwatches, An Unauthorized History’ will be attending the “Whiskey and Watches” event at Midwest Jewelers and Estate Buyers, Thursday, August 24th from 5pm to 9pm. 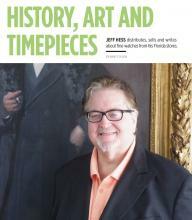 He will be speaking about watches, as well as signing copies of his book. Hess will also host a watch buying event August 25th and 26th at Midwest Jewelers. 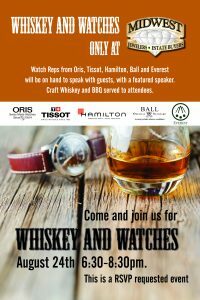 This is the Inaugural Event for Whiskey and Watches at Midwest Jewelers. Watch Representatives from Ball, Tissot, Hamilton, Oris and Everest Bands will be on hand to speak with guests. Craft Whiskey and BBQ will be served to guests from North End BBQ. RSVP requested event. RSVP’s needed by 8-21-2017. Please join us for this inaugural event!